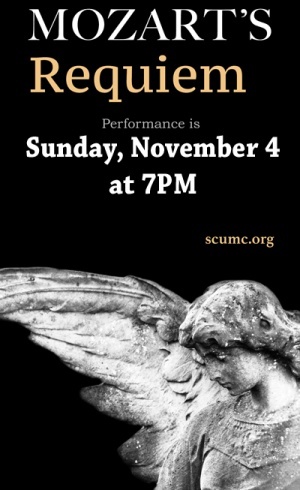 On November 4, 2018, Santa Clarita United Methodist Church will present Mozart's epic masterpiece, Requiem Mass in D Minor at 7:00 PM in their sanctuary, located at 26640 Bouquet Canyon Road in Santa Clarita. The choir will be joined by various other groups, including singers from Valencia High School, Los Angeles Mission College, and other local area churches. Professional soloists will join forces with the accompaniment of Mozart's intended chamber orchestra, including two basset horns, a clarinet-like instrument that was used frequently in the Classical era. Requiem was commissioned in 1789 by an anonymous nobleman, who intended to pass the work off as his own. Mozart believed that this massive work was being written for his own death and grew paranoid that someone was trying to poison him. He died in his home on December 5, 1791, at age 35, while obsessing over finishing the Requiem. Researchers have hypothesized 118 reasons for his death, including streptococcal infection, kidney ailment, and even - you guessed it - mercury poisoning! Nonetheless, the work was left unfinished at the time of his death, although sketches had been done for most movements. His wife, Constanze, was left penniless and desperate for the work to be finished. After attempting to find several people, Mozart's pupil, Franz Sussmayr, completed the work. Over the past 225 years, several other attempts have been made at completing Mozart's Requiem, although the Sussmayr edition is the one that is done most frequently and will be the version performed in Santa Clarita on November 4th. Rehearsals for this concert begin at 7:30 PM on Thursday, August 23rd at Santa Clarita UMC, and continue on Thursday nights through September and October. All choral singers, aged 16 and older, are invited to join the choir and participate in this masterwork.